Every year, my husband and I plan a trip for our anniversary… New England, Outer Banks, upstate New York, the Pacific Northwest…. We love to explore. 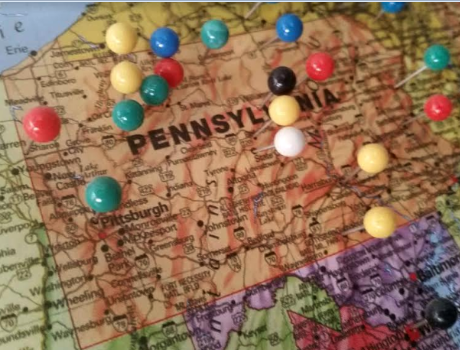 A few years back I got him a map of the United States, a perfectly-sized cork board and special pins and we’ve been pinning the map ever since – a personal reminder of all the adventures we’ve taken together to date. Early in the year we started thinking about what we wanted to do for our vacation. We knew we didn’t want to go too far and we wanted it to be an outdoors trip. We began searching for where to go, using that map as a reference of course. Michigan and the Upper Peninsula looked fun – and there are no pins between Ohio and the Pacific Northwest. Rhode Island is the last state in New England that we need to check off. A southern tour could be fun – hitting West Virginia, Kentucky and Tennessee each for a day or two. As we began researching the region we found there were so many unique experiences right at our finger tips, and affordable ones at that. It didn’t take too long to plan – and the idea was to have a relaxing vacation with plenty of outdoor fun and not much travel time. We live in the southeastern section of the Pennsylvania Wilds, so we decided to try to see the other portions and developed a circular trip to hit as many key spots as possible. Enjoy a daily blog article detailing the Knarrs’ recent adventures in the Pennsylvania Wilds, one day and one landscape at a time, Monday, September 10 through Friday, September 14 at www.pawilds.com/blog.